This pamphlet contains the text of the address made by Carl R. Gray, president of the Union Pacific System, before an annual banquet of the National Safety Council in Cleveland, Ohio, on September 30, 1925. The address begins with a brief history of railroads excerpted from "First Spikes in Railway History in England and America" by A. Saintsby (1925). 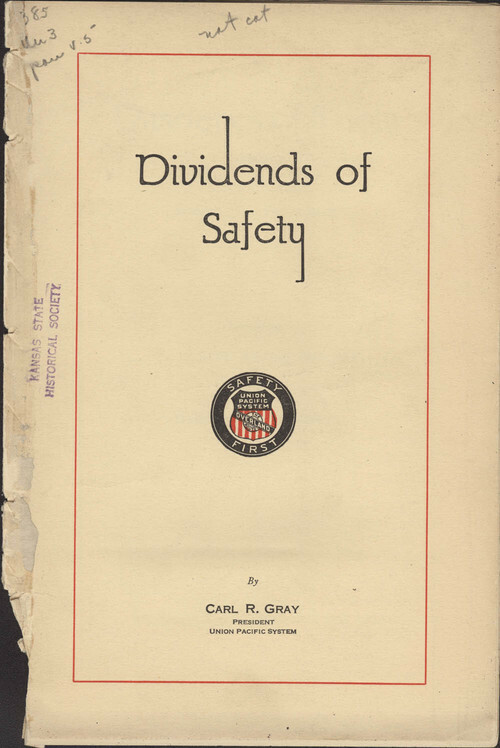 Gray then describes the history of the Safety Movement on Railroad, and the safety measures employed by the Union Pacific Railway Company to guarantee safe rail travel on their system ("Lives saved, limbs saved, homes saved -- 'these are the Dividends of Safety'").